What if everyone really meant Merry Christmas? What if Christmas is a core value of belief in a personal God who lived among us and His freely given promise of eternal salvation that no believer should reject or apologize for? What if Christmas is the rebirth of Christ in the hearts of all believers? What if Christmas is the potential rebirth of Christ in every heart that will have Him, whether a believer or not? What if Jesus Christ was born about 2,000 years ago in Bethlehem? What if He is true God and true man? What if this is a mystery and a miracle? What if this came about as part of God’s plan for the salvation of all people? What if Jesus was sent into the world to atone for our sins by offering Himself as a sacrifice? What if He was sinless? What if His life was the most critical turning point in human history? What if the reason we live is that He died? What if after He died, He rose from the dead? What if He was murdered by the government because it feared a revolt if it did not murder Him? What if the government thought He was crazy when He said He is a king but His kingdom is not of this world? What if He was not crazy but divine? What if when He said that He could forgive sins, He was referring to Himself as God? What if He is one of the three parts of a triune God? What if this is an inexplicable mystery? What if there is no power without mystery? What if the power He possessed, He exercised only for the good? What if He truly gave sight to the blind, hearing to the deaf, musculature to the lame, hope to the disillusioned, courage to the weak and even life to the dead? What if the acceptance of this seductive offer of government-as-god has ruined individual initiative, destroyed personal work ethic, fostered cancerous laziness, enhanced deep poverty and impelled thoughtless obedience to government in those who have accepted it? What if He freely did these things but sought no acclamation for them? What if after each of these miracles, He disappeared into the temple precincts or walked well past the crowd, lest the crowd hail him as a temporal or secular leader? What if there was in that towering personality a deep thread of shyness? What if He was shy about His Godness? What if He was shy about His goodness? What if He loved saving us? What if He was joyful but did not want us to see His joy? What if He knew all along how profoundly untimely and utterly painful the end of His life on earth would be but He neither feared nor avoided it? What if His greatest display of love was self-restraint on the Cross? What if most of the world that He came to save has rejected Him? What if He still loves those who have rejected Him? What if He still offers them salvation? What if His offer is real and forever? What if many folks today have rejected the true God for government-as-god? What if the government-as-god has set itself up as providing for all secular needs in return for fidelity to it? What if this seductive offer has been accepted by millions in America? What if the acceptance of the seductive offer of government-as-god has ruined individual initiative, destroyed personal work ethic, fostered cancerous laziness, enhanced deep poverty and impelled thoughtless obedience to government in those who have accepted it? What if the defiance inherent in the belief of government-as-god chills the exercise of personal freedoms for fear of the loss of the government’s munificence? What if government charity is really munificence with money it has taken from those who work and earn it? What if it’s then given to those who don’t? What if it is impossible to be truly charitable with someone else’s money? What if Jesus came to set us free from the yoke of government oppression and the chains of personal sin? What if freedom is our birthright, given to us by the true God, not by the government-as-god? What if the true God made us in His own image and likeness? What if the most similar likeness between us mortals and the true God is freedom? What if just as God is perfectly free, so are we perfectly free? What if we have failed to preserve freedom and have permitted governments to take it from us? What if we are not full people without full freedom? What if the world was full of darkness before He came into it? What if there is darkness still today but yet much light? What if we recognize that He is the Light of the World? What if Christmas is the birthday of the Son of God and the Son of Mary? What if we recognize the presence of the Son of God and the Son of Mary in our hearts and among us? What if the God-as-baby whose birthday we celebrate is the Savior of the World? What if we don’t mask this but live it? What if we say with our hearts and mean with our words — Merry Christmas? Former naval officer, federal investigator, forensic scientist, senior executive service member and pastor. In retirement serves as volunteer and life group leader at New Life Christian Church (www.newlife4me.com). Devoted to beautiful wife, kids and grandkids. Looking forward to the time when every knee will bow and every tongue will confess that Jesus Christ is Lord of all and that He is the Way, the Truth, and the Life. 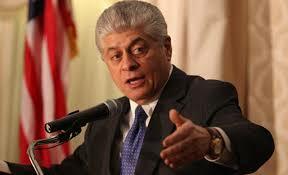 This entry was posted in Uncategorized and tagged America at Christmas, Andrew Napolitano, Merry Christmas. Bookmark the permalink.